Now that the weather is cooling down and we have been getting a few chilly nights, we thought it was time to introduce one of our favorite comfort soups. We remember ducking into cozy bars on cold winter nights and ordering this soup to go with little glasses of rice wine. If you have the ingredients it won't take you more than 15 minutes to make this. 1. 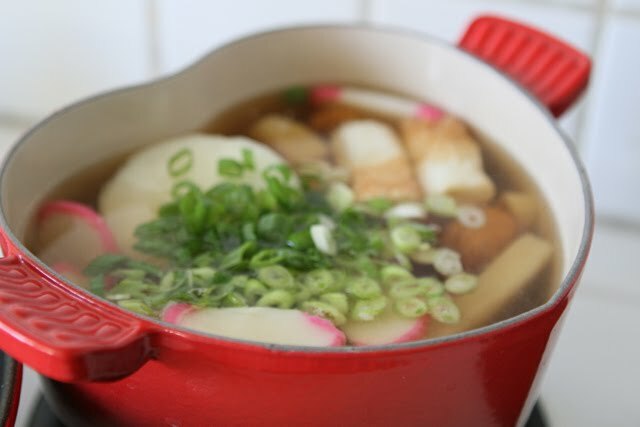 Put the seaweed and daikon into 5 cups of water and bring to a boil. 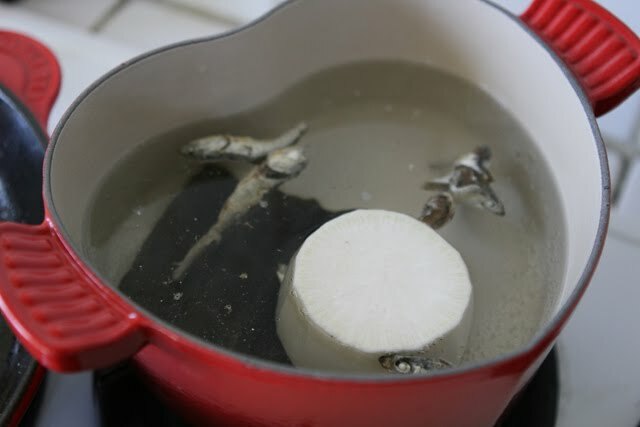 Add anchovies and boil for another 1-2 minutes. Lower heat and take out the anchovies. 2. Slice the fish cake into 2" pieces. 3. Put them into the broth and let it come back to a boil. Then let it simmer for a couple minutes. 4. Add the dark soy sauce and stir it in for another minute. 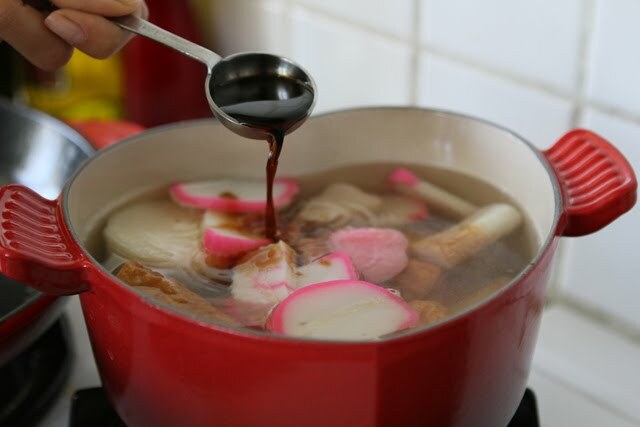 Taste the soup and add a little more soy sauce if it is bland. 5. Turn off the heat and put in the green onions. 6. 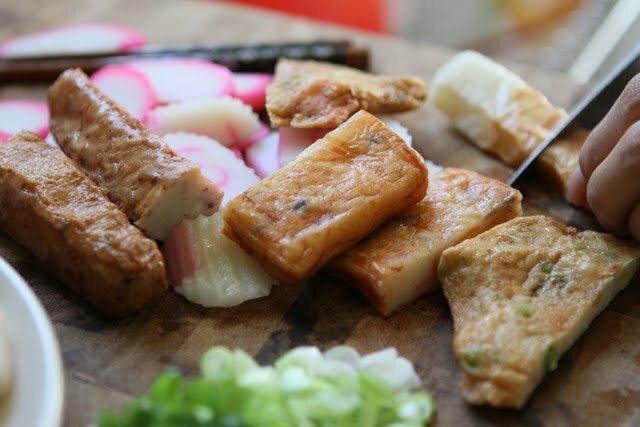 Serve with a little bit of soy sauce and wasabi for dipping the fish cake. Which section of H mart would I find fish cakes? Can you post a picture of what they would look like on the shelf? 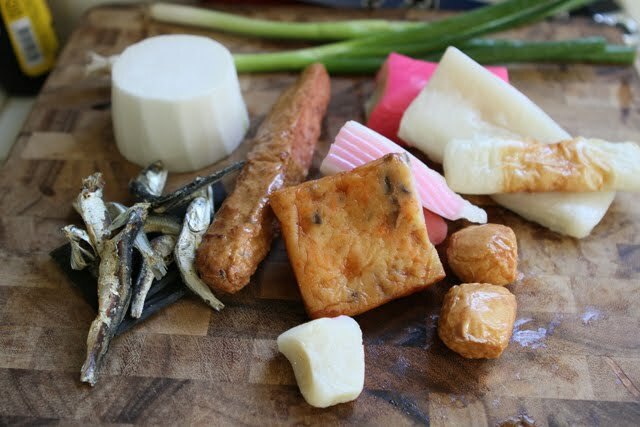 i have to be honest and say that odeng is not my favorite, but i do remember eating it for the first time on a cold winter night in the streets of seoul with my sister-in-law. OMG is your pot shaped like a heart? It's too cute! 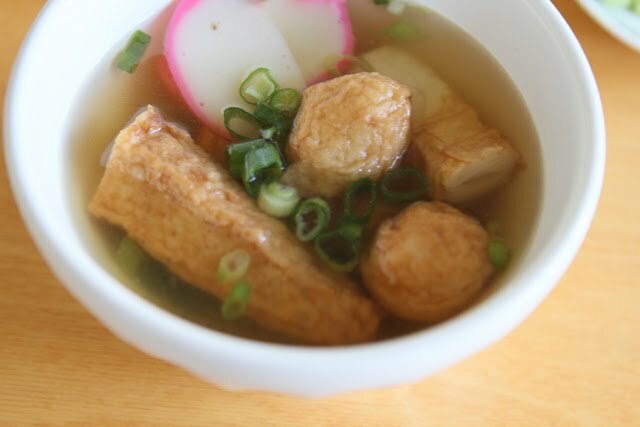 Oden (as Chinese/Japanese call it) is good ... my mom loves it! I'll be handing off the recipe to her as well. jesus that's a cute pot!!! yum! but i'm totally dying over your cute heart pot!! 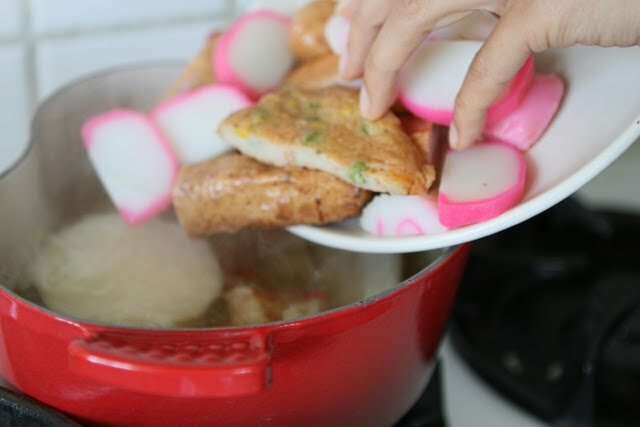 I bet the 오댕탕 tastes even better coming out of that heart-shaped Le Creuset! Look forward to making this on a cold night this Fall. Just found your blog! Love the photos and the recipes sound delicious. My husband and I lived in Korea for three years and we love to eat Korean food, but I am not very good at making it. Can't wait to give some of these recipes a try. Your instructions are very helpful. ok, this is officially my favorite blog. beautiful pictures of my favorite korean foods. love it!